Serve this cheerful and charming classic dessert to brighten any Christmas celebration. 1 roll store-bought swiss roll. 2 500ml tubs of store bought vanilla custard. 2 250g tins of sliced peaches, liquid drained. Layer your dish with the sponge cake that has thinly been sliced. Cover all the gaps with pieces of sponge. Sprinkle the kirsch liquor over the sponge. Pour 1 tub of custard and evenly spread it to cover the sponge. Cut up your jellies and place them over the custard layer. Layer 1 tin of peaches over the jellies as well as chopped. Pour the second tub of custard over the peaches and nut and evenly spread it. Evenly spread the whipped cream over the last layer of custard. 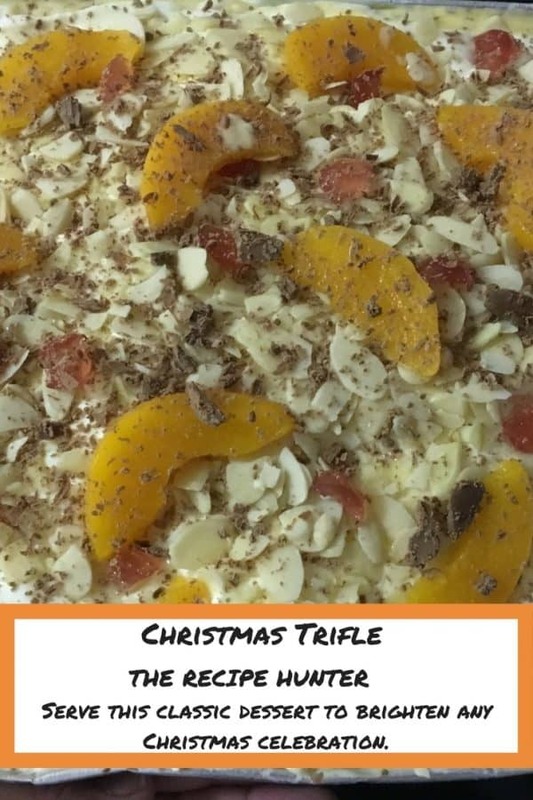 Top with chopped nuts, almond slivers, sliced peaches, cherries and grate flake over the finished trifle. Pop into the fridge to chill before serving. Thanks my friend – enjoy it. Delightful! This was just right for my friend’s housewarming! So glad you then enjoyed it.